Garden Cottage01493 855139work Self-cateringGarden Cottage on Barnard Crescent in Great Yarmouth is a cosy venue, attached to Barnard House B&B but with its own entrance and drive for off street parking. The cottage consists of one king size double or twin bedroom, a kitchen and a beautifully furnished lounge/diner that opens out with French doors onto the garden. There is also a small garden patio with garden furniture and a BBQ to be enjoyed on sunnier evenings. Lazy days are taken care of too with a selection of books, games, magazines to keep you occupied. The cottage is superbly equipped with all creature comforts; central heating, electric cooker, fridge/freezer, dishwasher, microwave, washer/dryer, crisp linen, fresh towels, hospitality tray, Freeview TV, DVD/CD player, free Wi-Fi, hairdryer and if needed, a cot. 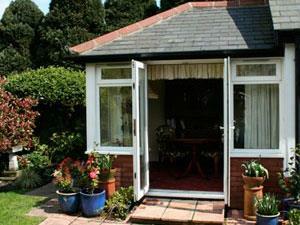 Garden Cottage has been designed with some aids for mobility-impaired guests and has a full wet room. For your arrival we supply milk, bread, eggs, butter, tea, coffee and sugar so those of you desperate for a reviving cuppa and a light bite have no fear. Garden Cottage on Barnard Crescent in Great Yarmouth is a cosy venue, attached to Barnard House B&B but with its own entrance and drive for off street parking. The region is easily accessible by road from all parts of the UK. Major trunk roads into Norfolk are the M11, A11, A12 and the A14 from London and the South-east, while the A47 and A14 serve the Midlands and the North. On entering Great Yarmouth from the A47 follow the signs to Caister, pass through 3 sets of traffic lights, Barnard House is directly on the right after the last set of lights off the Caister Road. We can collect you by prior arrangement.